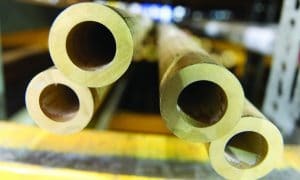 Alloy Metals and Tubes International now offers a product known for its unrivaled pitting and crevice corrosion resistance – Tungum tubing. Combining unusually high strength to weight ratio with ductility, excellent corrosion resistance, and first class fatigue properties, Tungum tube exhibits unparalleled versatility and longevity. Tungum tube can be found in many demanding environments and applications. These include oil and gas, offshore, dive systems, marine, medical, and others. In use since the 1930s, no recorded failures of correctly installed Tungum tubing exist. This track record of excellence causes many to say that Tungum tube is “fit and forget” tubing. It is also highly resistant to fatigue and shock brought about by vibration. Because of these features, its use spreads across the globe in a variety of industries and environments. Tungum tubing compares favorably to other common tubing used to fight corrosion. Compared to 316 stainless steel, Tungum offers 4-6 times the working life but does not suffer the same pitting and crevice corrosion issues. Compared to super duplex materials, Tungum provides a faster install at a noticeably lower cost. Experience excellent cost savings over the life of a project and reduce system down times by using Tungum tubing. This alloy installs quickly and is compatible with all industry recognized tube fittings. With other metals encountering a decline in usage, Tungum experiences growth in markets across the world. Alloy Metals and Tubes International is proud to be part of the worldwide distribution network for Tungum tube. Contact us today to explore how Tungum can save your job money and increase its longevity. Click here to read more.